Treat Yo'Self! Series is Safer's new series that connects students with SLO county professionals who attribute their success to their emphasis on self-care. Everyone benefits when practicing self-care, wellness, and mindfulness. Implementing self-care into your regimen can promote insights and connectedness to what you as an individual seek most. Whether it be relaxation, stress reduction, long lasting energy, healthy ways of physical and mental healing, better sleep, better digestion, or tips on moving your body- come learn from the best; they want to share their techniques with you! TYS! will run over the next two quarters, about every other Wednesday starting January 16th, from 11AM-Noon. Safer will host TYS! 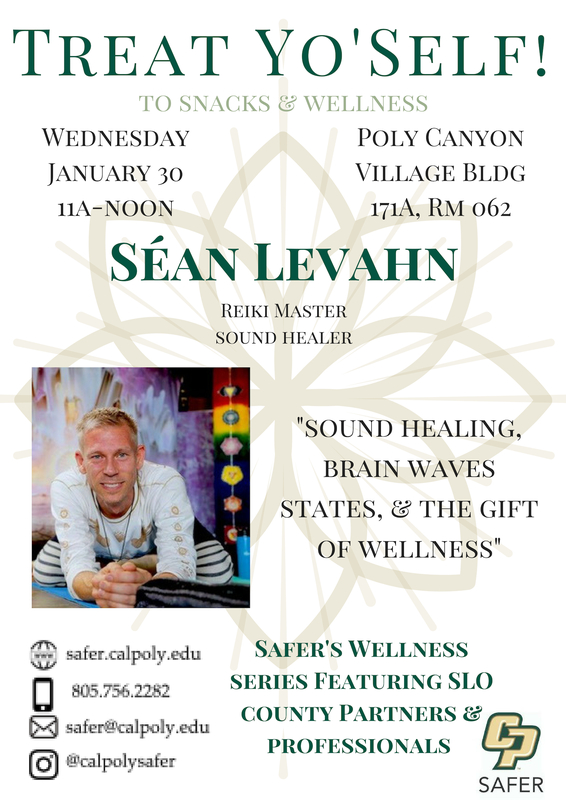 in the Campus Health and Wellbeing satellite location in Poly Canyon Village, Building 171A, room 062. Come and enjoy snacks, interact, and take away tips and tools to help build your personal toolkit for self-care practices.